My 53rd birthday is just around the corner....and I'm feeling good about it! Martha and I are heading up to 100 Tea Cup Tuesday posts next week! 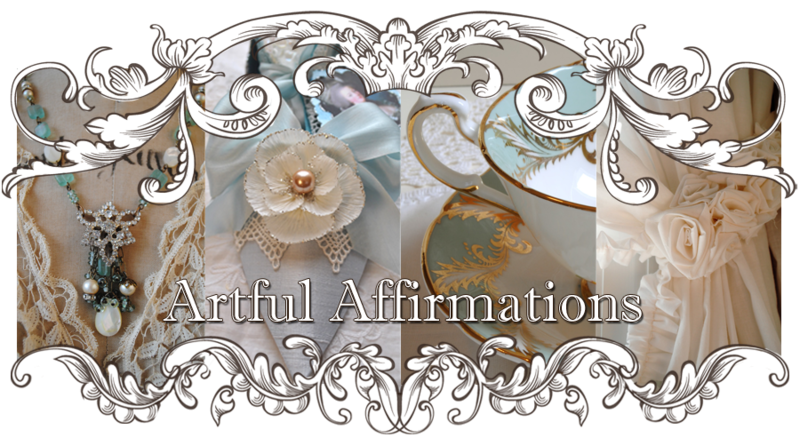 Artful Affirmations has always been about my art affirming my life. Art is how I breathe happiness! 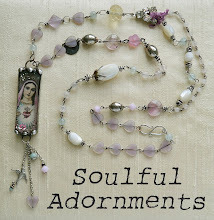 I have been sharing my creations on this blog for almost 3 years now...time flies! And...three years of having the joyous opportunity to come and see your creations, whether it be an ATC, poetry, a banner, journal art, Collages, tablescaping, tea, cooking, raising chickens, and oh so many more ways of living creatively! that I have a list a mile long of the projects I want to give a go! Blogging has become a welcome part of my life. Visiting with you all everyday has been a treat I am happy to continue! I appreciate each and every one of you, all your visits, all your comments, all your wisdom, joy and support! To Celebrate...lets have a Giveaway! 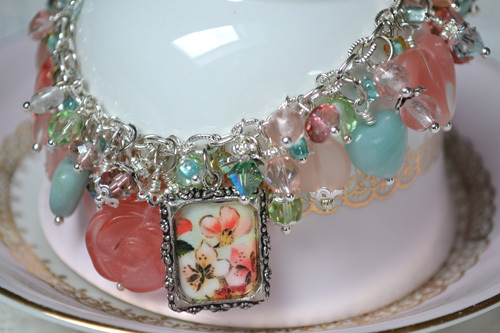 I used Springtime as an inspiration to create this delicious pastel bracelet. I squeezed as many charms on it as I could...enjoying the play of colors. There are new as well as vintage beads, and some natural stone too on this one, and an extra length, so it can be shortened to fit. To enter to win this piece, just be a follower and leave a comment saying you love the bracelet. 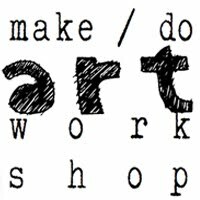 My next prize is a FREE DOMINO BOOK CLASS of mine at Creative Workshops! This class has 9 videos with 4 different style techniques that can be used in many art forms. If you would love to take this class for FREE, just be a follower and leave a comment saying you would love to take the class. The third opportunity for you to win is a Illustrations CD by Crafty Secrets. 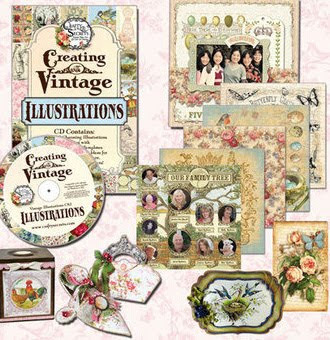 This is the most amazing CD full of all kinds of vintage images, die cuts, templates, papers and so much more! I love it! If you would like to enter to win this CD just be a follower and let me know you love the CD in your comment. And if you would like to enter for 2 or all three, just say so and I will put you down for it. I wish you all the best of luck! The giveaway date is March 12th, which is my own birthday. Thank you so very much for stopping by! Wow this some giveaway. You can put me down for the Crafty Secrets Illustrations CD. I love roses clip art. You have a beautiful and informative blog. I enjoy visiting. I love ALL of those, but I think I'll go for the Crafty Secrets CD. I've always wanted something from them and I try to enter all their giveaways. I wish their merchandise was in regular craft stores. I'd be in so much trouble then. Lol! FUN trouble. By the way, I love the colors in your bracelet. It's really beautiful and cheerful. 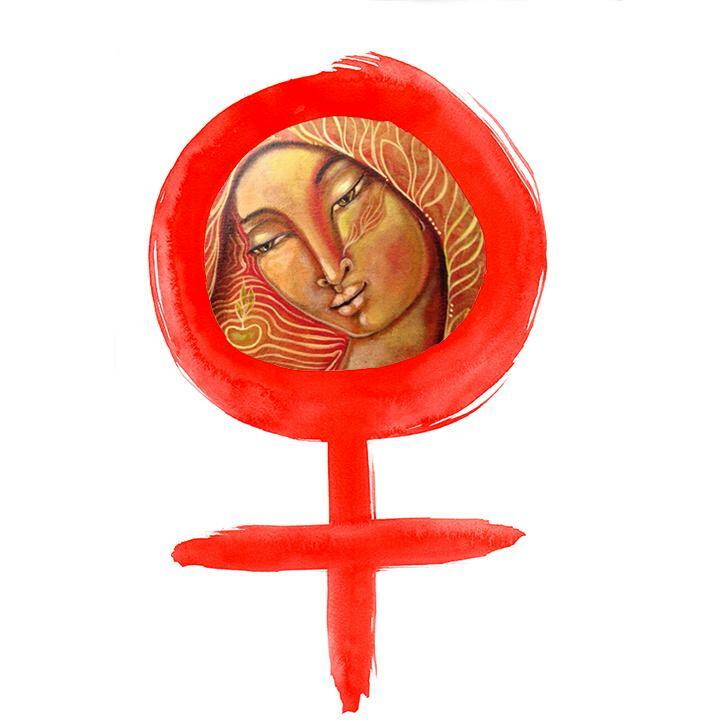 Just signed up to follow you... found you through "girlgab.com" over on MJF! Beautiful blog you have! I would love to be entered to win that GORGEOUS bracelet you are giving away. How purr-ty it is! Thanks for the chance to win it and Happy Birthday to you! I celebrate my birthday just 11 days after yours. you know it just not fair that some people don't look their age... really 53rd birthday Terri HE HE ! Enter me in for all three please! Wow amazing! Hi Terri...I would love to win the bracelet! Gorgeous! And definitely your colors! Congrats on your upcoming birthday! You're a young'un! I LOVE the bracelet. Heck, I LOVE all your work. I do follow you as well. I just turned 53 in January and love this age. Have a great year and a very Happy Birthday!!! Congrats! I'm not too far behind you at 51, a couple weeks ago! LOL! I would so love to win that gorgeous bracelet. Congratulations, Terri! Bless you as you celebrate your milestones this week. And, how appropriate that you have used "stones" full of grace and beauty in your give-away bracelet - STUNNING! Truly a work of art - and how smashing it would look on my arm!!! Do put me down for the bracelet prize, to be sure! Also - I think I just might make some use our of that Crafty Secrets Illustrations CD - My appetite for vintage images and late obsession with cutting small images out of cardstock for mod podge experimentation - well - sounds like a useful little tool for a joyful little artsy hobby. Enter me for that prize, too! May your celebrations be hallmarked with much joy and beauty! I just started visiting your blog recently and am really enjoying it. It would be so great to win either the bracelet or the Crafty Secrets CD. Happy Birthday, dear friend! I hope you celebrate in grand style. 100 posts for you and Martha is certainly a milestone...congrats as well. I would LOVE to win either your gorgeous bracelet, or the Crafty Secrets CD (I'm a graduate of the domino class). Please throw my name in the hat. Thank you for a chance to celebrate your milestones! Terri no need to tempt me with a prize to have me tell you how much I love your beautiful bracelet~such scrumptious colors! It is hard to believe you will be 53 and that your blog is three~ time really flies when you are having fun! Please do not include me in the give away~just stopping bye to say hi! What beautiful give aways. I would love to be entered in all three draws. Thank you. You are a March baby just like my mom! And you and Madonna are the same age! You are beautiful in your early fifties!! This is such a lovely giveaway! I'm happy you're blogging too. It is always so fun to visit here! Such beautiful art with gentle attention to details and color. 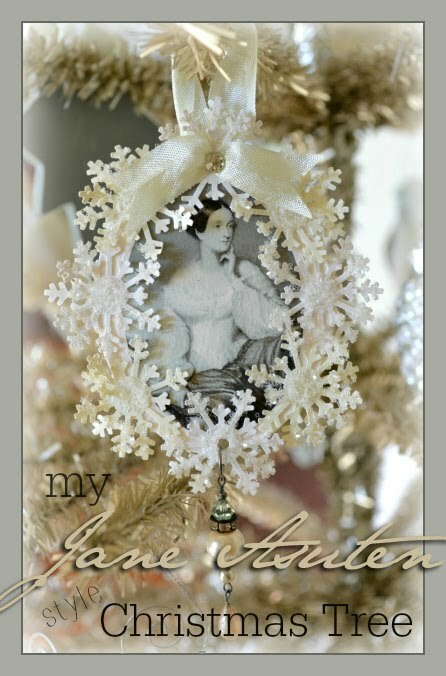 A wonderful vintage feel to your work and a joy to find your blog! Wow, I am in for all 3...I love the bracelet, I ADORE the domino book, and the cd's look incredible! You are so talented Terri, and I am glad I am getting to know you better thru the wonderful blogworld! What a fantastic giveaway! Please enter my name! You are so generous birthday girl! :) I would love to be entered for the bracelet you created and domino class as I already have the Crafty Secrets CD. And you're right, it is a wonderful CD!! I love it. Oh Terri waht a wonderful giveaway. Please out my name in the hat for all three Candy Prizes. Happy, happy Birthday, and many more to come!!!! And you have fantastic give aways. I would be really lucky girl if i can win your CD, it is so gorgeous to die for. Thank you so much for this chance. I was feeling a bit reserved to enter this giveaway as I haven't entered teacup Tuesday for such a long time. But for me, all of these items are SO GORGEOUS and really EXOTIC♡♡♡ Would you please count me in!!! Thank you very much for your sweet comment for my post. I would love a chance to win any of your gorgeous goodies, but I especially love the beautiful necklace with those natural stones. I love real stone jewellery. It is my 53rd year too this year! I really enjoy following your blog and your lovely work, even if I dont always have time to leave a comment on every post! Dear Terri, congratulations on your birthday-I wish you a wonderful day. Your giveaway is filled with beautiful things, the bracelet is just wonderful, and so are the 2 other prices as well. We will celebrate your birthday in VA Beach! 53 - such a young thing since I will be 65. OK, kiddo, enter me in all three. And I can say it, see ya soon! I loveeee that bracelet.Love it!Im already a follower.Happy early Birthday Terri! Wow so many wonderful things to choose from??? Although I have a sad little box of dominoes waiting for me to do something with, I cannot stop thinking about your gorgeous bracelet! So please do throw my name in the hat for the bracelet! Thanks for this fabulous opportunity Terri! Hi Terri! I love your blog. Please put me in the drawing for either the domino book tutorial or the illustrations CD. I would love either one. Thanks! And congratulations on your milestone! Well, happy birthday coming up!!!! I would love to try to win the milestones bracelet and the cd set! Wow, Terri, these are all very beautiful giveaways. I LOVE THEM ALL. It is hard to chose, so just put me down for them all, but I have to say that the bracelet is my favorite. I think 53 is the new 43...!! Thank you for letting me sign up for this giveaway. I really love the bracelet...so very pretty:) Please include me in your giveaway. Thank you. Such a wonderful thing to do Terri! Yeay! I love the bracelet, the colors are beautiful and feminine. I love the domino book class. Learning new things is priceless. I love the CD! There are sooooo many creations just waiting to appear! Just can't make a decision...lol! love the bracelet! i took the domino book workshop so i hope someone else will enjoy workshop-the bracelet and CD for me please. lots of birthday fun, wishing you the best ever day. Good morning, Terri! I just signed up to follow you! I have been signed up to receive your feeds for quite a while now. Terri, I would LOVE to be entered for a chance to win all three. Thank you for the opportunity!! And, Terri, that bracelet is GORGEOUS!! Terri, can't believe that I forgot to wish you a Happy Birthday -- I hope this year is one of your best ever. HAPPY BIRTHDAY TO YOU!! Many Happy Birthday Wishes to You, Terri (you sweet young thing)!!!! I love bracelets ... one of my favorite things. This one is gorgeous! Also, put me down for the CD. What fun! Celebrate! And, thank you for the lovely give-a-way. Wow, what amazing give-a-way celebrations you are having! Please-please enter me in all 3! I am a follower and adore your creations! Terri, Happy Early Birthday, congratulations on so many teacup posts with Martha and thank you for such a generous giveaway! I would love to be entered in the CD giveaway. 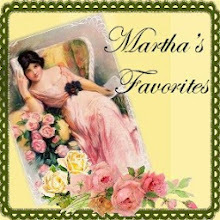 I have been a follower of both you and Martha and truly enjoy your creative blog! wow! I love all 3 give away...did i say LOVE all 3 give away. thanks for the chance to be a winner. 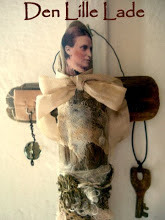 and thank you so much for posting such loveliness on you blog. thanks so much for posting such loveliness. Thank you so much for the giveaways Terri...you are so generous and kind. I would like to be entered into the bracelet giveaway and also the CD giveaway since I've already taken your domino class. You are a peach. Happy Birthday to you!! !Been following you for a while now. Love, love your creations! I'll take my chances and go for door # 1,2 and 3...hehe. thanks so much for sharing the joy! such a lovely giveaway.. and happy early birthday... the bracelet is gorgeous... but i have wanted to try the dominoes .. so ill choose the free class.. have a wonderful day.. suns out here.. Happy almost birthday to you! My 54th is just around the corner so you are not so old! I would be just so excited to win your domino booklet class. How very generous of you, Terri! I have loved reading your blog and through it have visited many others that I am now following. Your "free" tutorials have been very instructive, and I can only imagine how much fun the dominoe book class would be. I've really wanted to try my hand at that. Of course, the beautiful bracelet that you've made would definitely turn my head. Your birthday will be very special I am sure, with all of the lovely friends you've made through your blog, there's no doubt that you'll have a "mailbox" full of well wishes. Blessings to you! I feel the same way about blogging and the place it has taken in my life. Art is such a beautiful way to express ourselves....and you sure do your part to bring beauty to all of us here in blog land! I would love the CD...please enter me in for that! You are very sweet, Terri--I hope your upcoming birthday is wonderful for you--I have been a follower for quite some time now, and I LOVE all the generous giveaways you are offering--the gorgeous bracelet, the domino book class, and the CD--I would be over the moon if I was able to win any of those! Have fun with your giveaway, and thank you for always being such an inspiration to so many! Happy Early Birthday, Terri! Having passed the "53rd" milestone a few years back, I can only say that things only get better!!! I would love to be entered for the Craty Secrets CD. Vintage is my middle name! I love them all! I wouldn't know which to pick if I had to single one of them out. So please put me down for all three. And a happy almost birthday to you! Terri, the bracelet is gorgeous!! You are so talented and anyone would be lucky to have such a beautiful reminder of someone making the world a little more beautiful every day. I've been so busy lately at work, so it's been a while since I've been able to pop in to say 'hello'. But like you, I have to keep creating in one form or another. I would love to take the class on the domino! so beautiful and please register me in the drawing!!! beautiful site! Your blog is so gorgeous and so are all your creations. I think that this giveaway is lovely. I think I would love the domino book class. I love your videos, and this looks sooooooooo adorable. Thank you for including me in your giveaway. and a very Happy Birthday to do. have been following for a little while now,. I Love the bracelet, would love to win it!!!! I am already a follower. If you want to enter my fancy apron giveaway, here is the link!! Winning your beautiful bracelet would be the frosting on the delicious cupcake of blogging! Please enter me in your giveaway. I love how you used one of your delectable teacups as a prop. Terri, please put me down for the domino class and Illustrations CD. I have "played" around with the little domino books and have lots of supplies but really need guidance! LOVE your teacups...I have my grandmother's collection and cherish them. Yay Happy Birthday upcoming...wishing you mega-sparkles..! What super generous giveaway..it is ALL fab and beautiful and I love them all..so all! HUgs and happiness..thanks for your generous spirit you constantly share...may many sparkles in the Universe come back to bless you! First of all Happy Birthday! A little pre-emptive, but you can't hear it enough in my world! Beautiful things you have offered your followers as always, the bracelet is sooo pretty. Any of them would be a welcome addition to my artistic life, so thank you once again for your generosity of spirit! 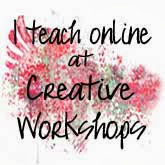 I found your blog on Shelly Hickox's Blog (I found her blog from Creative Jump Start. I visited your blog for the first time yesterday. I was so excited to see the tea cups. I have a small collection of tea cups that I treasure. I would love to be entered into all 3 giveaways. I love the bracelet and would adore taking one of your classes and I've been a Crafty Secrets customer for years. I'm so glad I stopped by . . . it's nice to meet you! Happy Birthday! This is such a wonderful giveaway :-). I'd live to be entered for all three :-). Thanks so much!! I so enjoy reading your posts. HAPPY BIRTHDAY!!! I'm right behind you and will strive to be as positive as you are! I love the bracelet--please do tell about the china pattern charm! Hello and Happy early Birthday, Terri! May your day be filled with all you love. parabéns tudo é fantástico e maravilhoso sua bondade em compartilhar!!! Love all these eye-candies! Thanks for the sweet comment on my blog. I love your blog and look forward to getting emails telling me you have posted. I love love love the bracelet. My gosh it's beautiful. Happy Birthday Teri!! Love your blog and the fun tutorials. Im wishing the bracelet was on my arm! Terri, to say congratulations on the success of your blogs and your class just doesn't seem sufficient. I'm so glad I found your lovely energy! 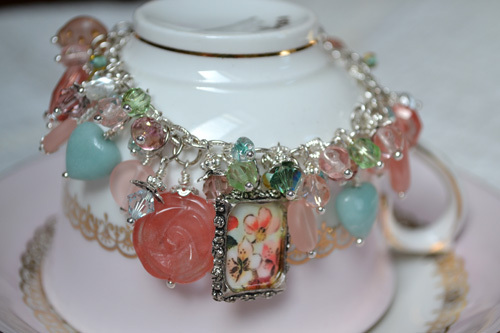 I love the bracelet, and would like to be in that giveaway, and also the Crafty Secrets CD giveaway. Aren't they great?! Holly M.
It's a tough choice, everything is so pretty. I'd have to choose the CD's. I'm a sucker for anything with pink roses. Happy Birthday Terri, I just celebrated my 53rd a few weeks ago. You're only as young as you feel, right? This is such a generous giveaway! Happy, happy Birthday, dear Terri. Have a lovely weekend and I hope there is plenty of sunshine heading your way! oh Terri, I just adooooore the bracelet, wouldn't it be nice to win it? I love the colours and all of it! What a wonderful giveaway! Of course I adore the bracelet. Thank you so much for your lovely note you left for me. It made my day so much brighter! WOW! I love all of those! Hi Terri, early congratulations on your birthday and three years of blogging! Love your teacups btw. I love the bracelet and the CD of Crafty Secrets looks gorgeous too. I would love to take the class too but I don't live nearby :(. Thanks for a chance of winning these giveaways. The bracelet is very beautiful and whoever receives it will be very lucky indeed. What caught my eye was the piece in the center of the bracelet. I wondered if you made that from a piece of china or broken tea cup. I had seen something like this before but didn't know the technique used to encase the china. I am also looking forward to checking into your domino books... everything is so interesting. Enjoy your cake and eat it too! Hi Terri! I am a new follower, just found you via Pinterest, please enter me for all three as I can't decide which I like the best LOL! Although I do LOVE bracelets...but then I love creating stuff too...and learning new techniques. Oooh too many choices! Ok I'm off to watch your video to make crepe paper flowers Ciao! Hi Terri...you really have outdone yourself this time. LOVE the bracelet...it's my favorite piece of jewelry and your creation is stunning. I think we should all be giving you something for all you do for us! I did a take off on your elegant shoe for my Tasha Tudor Valentine exchange. WIll post later so I don't ruin the surprise. YOU ARE AMAZING..thanks from my heart! Hi Terri and Happy Birthday to another Pisces...My birthday is a few days behind yours. I have become a follower and would love to enter all three. The bracelet is beautiful, the CD is great and would love to learn more about the domino books. Your blog is wonderful! Hi Terri....I started following you just recently but I think this must be my first time commenting! I don't get on the blogs much but plan on changing that by making a habit of stopping by more often. I love your blog and oh my goodness is that bracelet amazing! I would think I had died and gone to heaven if I won that so please put my name in!! The others too if that's alright? Will be back soon...wow you have a lot of commenters on this one!! Sorry about that! I meant to say Happy Birthday coming up! I am 57 so you are just a young pup.~~. Happy Birthday and Happy 100th Tuesdays! I so love your blog. I would love to win any of these but especially the bracelet! Such a P R E T T Y charm bracelet, thanks for sharing. And Happy birtday to you as well...my DH turned 53 yesterday. Enjoy your day. Fabulous! Love the bracelet and the domino!! Just fab! Thank you this opportunity! Happy birthday! Any one of those would be a treat to win - please include me in all three! What gorgeous stuff. I wouldn't expect any less from you though. You are the queen of gorgeousness! Please include me. I feel lucky just taking part in your giveaway. Your blog looks fantastic. Happy Valentine's Day! I can't believe that it has taken me so long to become a follower. Life gets so busy blogging - I think you know what I mean!!! Thank you for coming to my blog and leaving such lovely comments! I think your birthday is very close to mine and I wish for you a most beautiful day when it arrives - I would love to share a cuppa from one of those most beautiful pieces of china which I so adore and also collect - a few anyway! 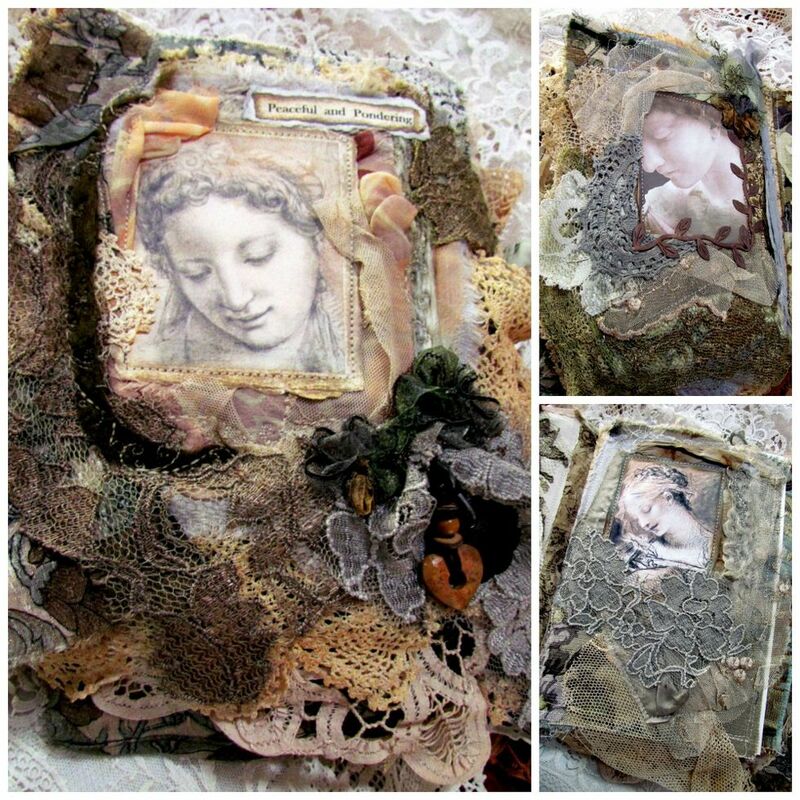 Your giveaway is soooo generous Terri and I would be so happy if I was chosen to win the third gift of the CD set of Crafty Secrets - wow just imagine how that would improve my creations. I love your bracelet. Would like a chance to win it. Makes me feel like spring is just around the corner. Congratulations on your upcoming birthday Terri! I love your art and beautiful blog! :) The bracelet has such beautiful colors in it! What a beautiful & generous giveaway! I'm already a follower and I would be thrilled to win any of these three loverly prizes, although I think the bracelet is my favorite! Such a beautiful way to celebrate your birthday! Thank you for the chance to win! This is so typical of you Terri - LOL! Its your birthday and you are giving away the gifts! And 53 is not old my dear, you sure as heck don't look it. You still have many more years of making art ahead of you. May everyday be special for you, not just your birthday. Nobody deserves it more, you are such a sweet person. Happy Early Birthday Terri. P.S. I'd love to take your Domino Class. You know I'm nuts about them. Wow this is some wonderful giveaways . I love visiting your blog especially on Tues. to admire your teacups. Have been a follower for quite some time now .I love all of those give aways but you can put me down for the bracelet and Crafty Secrets CD thanks for a chance to win . What a fantastic giveaway! You can put me down for the bracelet and the CD. Thank you for this chance! I am a happy follower! Oh Terri, it goes without saying...but I'll say it anyway, "I love, love, love, them all!" I would love to wear the beautiful bracelet, take your domino course, and have the CD! It seems we are the same age:) I will be 53 in April. 52 was great, so I think 53 is going to be great as well. I hope you have a wonderful birthday! Thank you for inspiring us with your creative life! I love your domino class and I can't wait to start one for myself. Please enter me in the giveaway for the beautiful bracelet! Have a great birthday! I love your blog and look forward to reading it every week. What a terrific giveaway. I'd love to win your gorgeous pastel bracelet. The Domino book class and CD are great prizes too. Congrats on 100 Teacup Tuesday posts. Hope you are planning a fab birthday celebration in March. I would love to be entered into the drawing for your beautiful bracelet and the Crafty Secrets CD. I've taken your Domino class, and highly recommend it to everyone, and hope that whoever wins it loves it as much as I did. Holly M.
All you teacups are so beautiful, but this one is really special. She's quite smug sitting with all those lovely vintage valentines. All your prizes are great, but I would really use the Crafty Secrets Illustration CD. Happy Valentines's Day! Oh wow...i love it...all of them!!! Love the giveaway. But I love your blog more. You touch my heart everytime! Hope you have a wonderful birthday! You are so generous, Terri! Thank you so much for offering give-aways! The bracelet is absolutely beautiful and I'd wear it proudly. I really enjoyed taking your Altered Domino class and have made several so far (great little gifts for family and friends!). May you have a very special birthday! Start your birthday celebration now! I'm sure you are going to have a wonderful year. Thank you for offering such generous give always. The domino book is sweet and I would certainly enjoy the lessons, but I have to admit that I'm drooling over the handmade bracelet. I would be thrilled to be the winner of any one of the gifts. I would love to win all of the above. Thank you! Happy Early Birthday. I'd love to be entered for all three of your giveaways! Always beautiful to stop by your blog. Gorgeous Terri - I'd definitely love to win these! Happy Birthday and congratulatons to yo and Martha - thank you so much for hosting Teacup Tuesdays! Hi Terri! I've been a follower, and I would like to take the Domino book class for free. You are sooo talented and generous!! I wish you an early Happy Birthday, Terri! I love ALL of those, but put me down for the Crafty Secrets Illustrations CD. Thanks for the chance to win. Terri what a lovely and giving way to celebrate your Birthday! I have 3 children with birthdays in March the other is in November with her father:) Everything here is just splendid! I am so glad I signed up for your blog feed after finding your lovely blog a few weeks ago. Have a magical week and I do hope your birthday is simply Amazing! Another lovely post from you with all lovely gifts - any of which I would be thrilled with. Looks like you are building up to quite the birthday...adding my own warmest wishes. My birthday is just before yours, Terri - I have 8 days and 16 years start on you, LOL. The CD's would make this vintage crafter happy and as for your bracelet....it is stunningly gorgeous - needless to say I'd love to be put in the draw for both. I would love to have the craft secrets cd.Please enter me in your giveaway,I am trying to implement all the beautiful things I see in your blog to this part of the world...Oh and Have a Happy Birthday! ENjoy your Special Day Terri. Happy Birthday, Terri, from one Terri to another! I'm about a year older - just hit 54 in November. I'd be thrilled to win any of these prizes. Thanks for the chance to win. Hope you enjoy your big day! I have just celebrated a large milestone in my life, my 80th, so enjoy being so "YOUNG"
Wow Terri what a wonderful giveaway! I would loooove the bracelet or the free domion class. I have admired your domino on Pw and am still wanting to make one. and the bracelet is so very pretty. please sign me up!!! and a very Happy Birthday to you! Happy Birthday early!!! I'd love to win the bracelet!!! It's beautiful!!! Wow! I love this bracelet and your site!! following you!! WOW! Beautiful blog and work. I would love to be in all 3 drawings, need all the chances I can get! I would love the bracelet, it is beautiful. And an early happy birthday to you. What a gorgeous bracelet!! I love it! Since I have taken you fabulous "domino class" and totally loved making these; please sign me up for either of the other 2. This is so generous. Thank you so much! Would love to win that pretty bracelet. Your b'day is the same day as my oldest granddaughter. Love it! Absolutely STUNNING! You create a literal "work of art"!! Wonderful give a ways... I have a grandaughter learning to make jewelry ... she would love the bracelet!! I would love to have the Crafty Secrets CD, and it's my birthday on March 13, the day after yours! 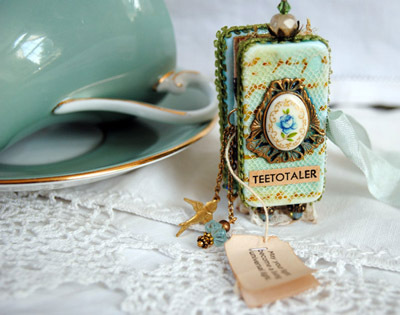 I love your site and so look forward to Teacup Tuesday. Happy early Birthday;)))) I'll take my chances for all three please! thanks so much for this. The bracelet looks good enough to eat! Please enter me for all 3 drawings. Happy birthday! Oh, Terri - what an exciting, generous giveaway!! I would be thrilled to win any one of them! But...I must say I adore charm bracelets! This one is truly gorgeous! My birthday is in March, too - on the 25th! Oh, and I'm already a follower of your lovely blog. Hi Terri, Please enter me again for the bracelet or the CD. Thanks much! Holly M.
Thank you for sharing and the chances to win! Wow, love the Bracelet, the class, and the Crafty Secrets goodies. Thanks for the chance to win. This is my first visit here and its a marvelous place. I would love to be entered in all three of your drawings. Now I'll visit more posts and see what other wonderful things you have to say and show. Please enter me in all three! Wow... Amazing! Love your blog so much! Happy early birthday! Oooh, the gorgeous bracelet! The colors are my favorites. Thank you for your generosity of heart. Oh Terri...I can't believe it's already your birthday again. I remember when you had your 50th. You are an amazing lady and everytime I see your lovely creations I wish that I lived closer to you and could art with you all the time. I would LOVE to have the opportunity to take your free class, but I would never turn anything free away! Hope you have a terrific Tuesday! Hugs! I'm a Follower and thank you for this wonderful Giveaway. You have lots to celebrate, m'lady. I love the bracelet; such pretty colours! I would love that bracelet and love the free class. Already own the CD. Thanks so much for the ability to win. Yes, please enter me in the contest for the bracelet or the CD. I've taken your class, and LOVED it. Thanks, Holly M.
Terri I love your Teacup Tuesdays! I love the violets cup I do believe it is my favorite so far:) Have a magical day! Dear Terri, I just found your blog because my friend Nancy sent me the link. She participates in teacup Tuesday. I just became a follower. I would love to be entered for all 3 prizes. They look spectacular! I just love your Blog. Beautiful. Been following for a while. Would love to have a chance at your give away. Hope your birthday is wonderful. Mine is 3/1 and I have been celebrating for a week already. I'm so glad I did not miss your birthday, Pet........what a beautiful day I wish you as you come upon the celebration of that day...and I will be celebrating over here for the gift of you and your friendship. And I will also wish you another portion of JOY. What a lovely giveaway. I'm already a follower and I'd love to take your domino book class. Enjoy the art retreat! Wow! Some awesome giveaways, Terri! You are such a talented and a very generous person! I visit your blog everyday to see if you have new postings! Like you, I love vintage tea cups and saucers. Please enter my name, Marlene Jackson (dugay1914@cox.net) for the bracelet and Domino class. Thank you, Terri! I hope you have a wonderful vacation! I saw your Domino Book on Pinterest and fell in love with it!! Would love to make one!! Can I get the instructions? Thank you for sharing such a beautiful project!! Three milestones to celebrate, congratulations, Terri! I love the bracelet! There, I said it, lol. Thing is, I would love to see your domino book tute as well though, and as to all those fabulous images, well, they would be awesome as well. So, pleaaaaaase, put me down for all three. Darn, that sounds greedy, but I just can't decide! Happy Birthday! Thank you for the giveaway. I would love to be entered to win all three of your wonderful prizes. Your work is absolutely gorgeous and I look forward to seeing what else you create. And of course I look forward to Tea Cup Tuesday. My boyfriend doesn't get it, but I love tea cups now! Hope you have a great birthday! Happy birthday for next week - I've been noseying around your blog and loving some of your teacup sets ... very special. Please put my name in the bracelet draw, I would love looking at all those gorgeous colours and danglies hanging from my wrist. Happy Birthday to You! Your blog is so very nice and elegant. I like to follow your posts. I would love to learn more about the domino class. I love the bracelet! Such talent! Please count me in on your giveaway! I just found your blog..love the bracelet and would really love to win it for my 70th birthday on the 24th.Really onto crafts so would enjoy the cd as well.Just love roses! What Is So Special About Getting Old?